What was your career path before you became a monk? 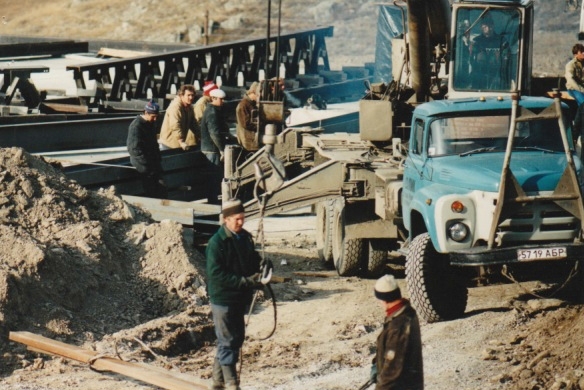 I started my career as an engineer - working in a diverse range of industries, and locations, before co-establishing a construction business in the Soviet Union. Few foreigners had the opportunity to engage with the Soviets during this tumultuous time - it was such a great adventure. The lifestyle became increasingly fast paced, complex and stressful so I returned to New Zealand for some respite. But the stress continued to escalate as I lead a team developing a chain of nationwide retail stores. The stress and angst became formidable - until I decided to do something about it. I learnt the Ascension meditation techniques taught by the Ishayas of the Bright Path. Then the most unexpected thing occurred - I became an Ishaya monk. I am a modern day monk – an Ishaya of the Bright Path. I lead a normal life: I have a partner, Sally, who is also an Ishaya monk. An Ishaya monk is someone, woman or man, who is committed to remaining attentiveness to the stillness and peace within; and who is dedicated to helping others experience self-fulfilment and inner peace. Within our teaching there are no rules or regulations, belief system, or dogma. Although our teaching is ancient it is not a religion, nor do we idolise a guru, or wear robes. All that's required is to be active in letting go and remaining attentive to the Stillness throughout the day. 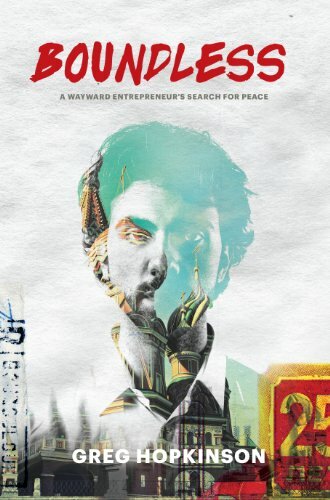 We are passionate about all of humanity experiencing unbroken peace, happiness and contentment; and living in harmony. It's possible, and it starts with each of us. All that's required is to make a choice. Sally and I are passionate about producing material that communicates practical and down-to-earth ways that anyone can experience more joy in their life. Anyone who follow their passion. What is your idea of pure happiness? Remaining perpetually free from thinking – being fully attentive to the Stillness. With such an approach it is impossible to be anything other than happy and enlivened. When I started viewing my photographs in preparation for writing Boundless, it struck me that I was viewing a visual catalogue of the Soviet Union at a significant time in history. 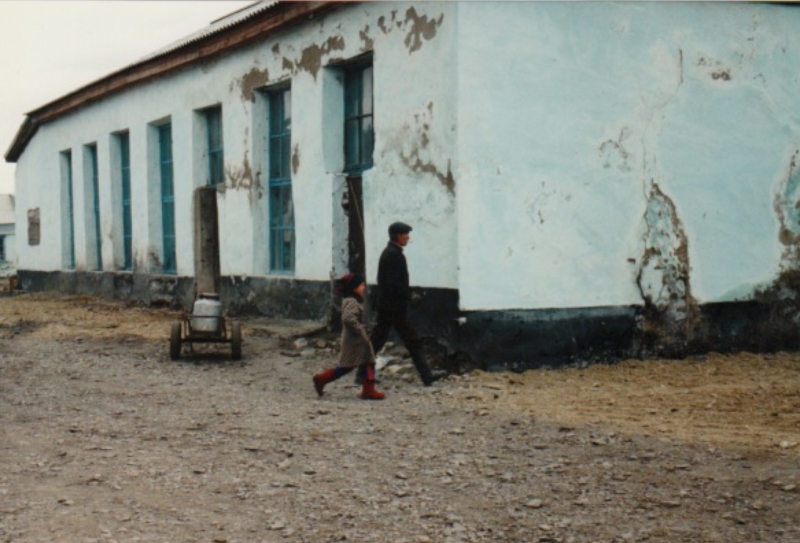 It was a boy’s only affair at the commissioning function for a meat processing plant located in the vast tree-less Kazakh steppe. This site was located near the launch pad for Yuri Gagarin’s rocket that made him the first man in space. I visited this site twice. Each time I was entertained by the local State Farm manager - a gracious character who was the tribal chief, farm manager, patriarch, and community leader. A Kazakh girl in traditional costume at the opening of a small-scale meat processing facility in central Kazakhstan. There was much fan fare and ceremony over the opening of this plant – it was an important facility for the people of this huge state farm. A New Zealand milk processing facility was installed in this building a year before I arrived in the USSR. Political favours amongst local ‘leaders’ required that the milk processing be relocated to another town a couple of years later. Such random acts happened as the political power base shifted and changed in some locations during the collapse of communism. V.I. 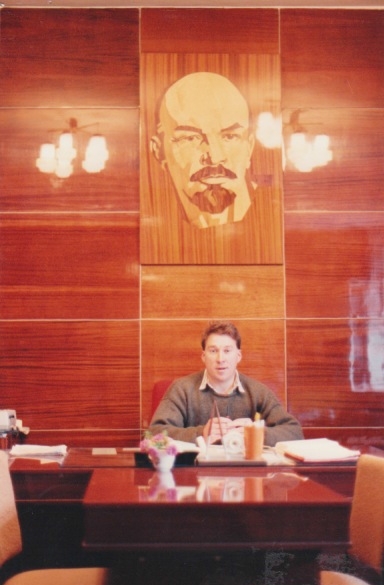 Lenin adorned every office when I first arrived in the CCCP. After Christ, we reckoned his visage was the second most recognisable face in the world. 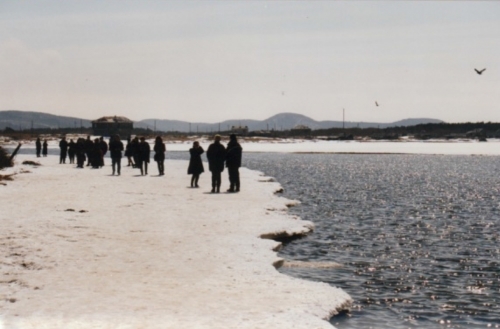 This photo was taken on my second day in Russia in 1990. I didn’t have a clue where my journey would take me. I still don’t. Eighteen months after this photo was taken tens of 1,000’s of V.I. Lenin’s portrait had been discarded. The diversity of Russian peoples fascinated me. The Tatars are one of the larger groups comprising the Russian Federation. Local girls dressed in ceremonial costumes engage in the opening ceremony of a meat plant we built in Tatarstan. So much change has occurred in Russia over the last 25 years – occasionally I wonder what has become of people like this child standing on the threshold of her home. Equipped for the climate, she has a presence that suggests she’s had more life experience than her age would normally avail. The boardwalk on the ground behind her provides clean passage over the wet and muddy conditions that can exist during spring and autumn in this remote Altai village. Sakhalin, a huge island located in the Far East of Russia, north of Japan was the location of one of my business partner’s offices. I unsuccessfully attempted to do a deal here for several cold storage facilities. Good people and beautiful place, it compensated for a lost business opportunity. Drinking Georgian cognac was one feature of a Russian BBQ, or shishlick. As the Russians say: ‘It is only an alcoholic who drinks without toasting’. Our Man in Moscow displays his flying prowess during my first full day in USSR. 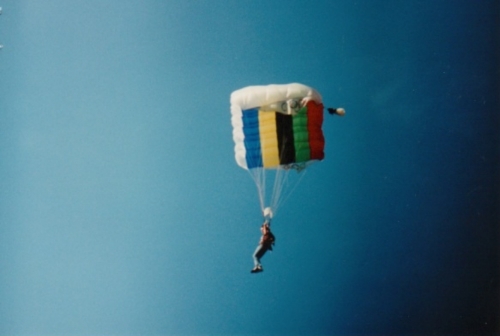 He jumped from a helicopter in southern Siberia. Spring is visually an unappealing time in Russia – grit, dirt, and settled airborne pollution smothers the snow. As the snow melts it leaves layers of debris coating the earth. The behemoth in the background is the OKMC steel mill. It was situated very near a city, where it’s red dusty emission discharged into the local atmosphere. During the early 1990’s the life expectancy of the average male was 53 in this city. Pollution was probably a factor. Not to be mocked: traditional transport. The horse and cart has stood the test of time and probably will continue to do so. With a bit of good lovin’ and roadside pasture, and these buggies can function in most climatic conditions. Taking a position was a common approach adopted by Soviet functionaries – they were particularly good at staking their ground, creating barriers, defending them, and negotiating a favourable outcome. The robustness of these encounters became increasingly familiar for me. Socialising was a great aspect of Soviet business – it was often the glue that prevented anyone from taking things too seriously. The Soviets were great hosts and relentless joke tellers. It’s all go for the locals as they construct the building envelope for the slaughter floor and refrigerated facility at Ust Koksa in the Altai. In following years we took complete control over every aspect of projects – including the construction of the buildings – often shipping prefabricated structural steel from New Zealand. It minimised any cost or timing surprises during construction. 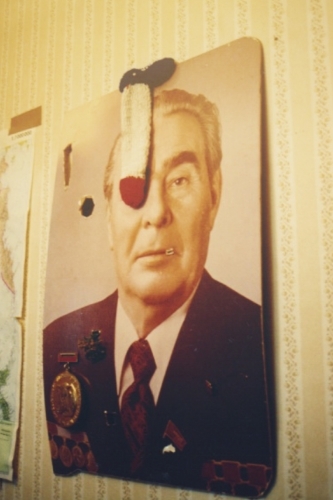 I encountered this image as I entered a Soviet flat for the first time in Moscow in 1990. I thought it was a relatively bold thing to do, given that the Soviet Union was still in tact, and I had been led to believe that such behaviour would be punished with a lifetime in a Gulag. Maybe one could get away doing this to Brezhnev, but not Lenin or Stalin? This band was playing in a park in St Petersburg in 1991 – a month earlier the city was called Leningrad. 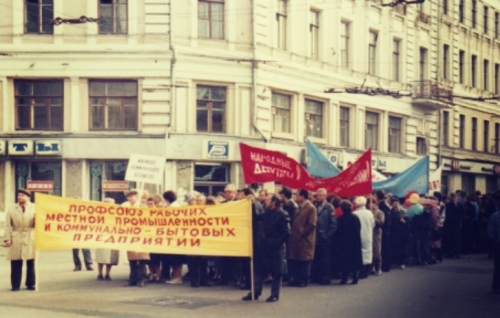 The collapse of the Soviet Union was a tough and disorientating time for many pensioners. Probably not for the first time in their life, everything – the society, the economy and the sense of place - they had worked for and helped create effectively evaporated within months of the collapse of the Soviet Union. Pensions weren’t paid for months, food rationing was severe, inflation exploded, and the roubles they had squirreled away devalued ten fold. Every hardship they had endured; the loved ones they lost in the Great Patriotic War (Second World War) combined with Stalin’s purges before and after the war seemed to be all for nothing. 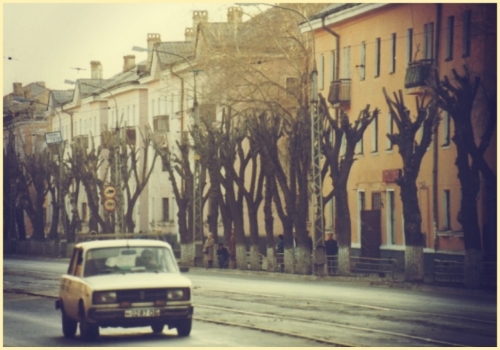 A Lada makes it’s way along the main street of a southern Ural city. Few people owned private cars around 1990 but by 2000 that had all changed. This Soviet Railway Station appealed to me, not only because of the strong geometric form and impactful lighting, but also for its invitation to lead me on a journey. The structure gave me confidence to ride a train - it promised a safe passage to my destination. We have modified this image as our motif for www.Boundless.info – to inspire people to come on a journey. I really had no idea what the theme of this rally was – whether they were supporting communism or opposing it – such was my complacent approach to learning the Russian language – and the randomness of Moscow life. 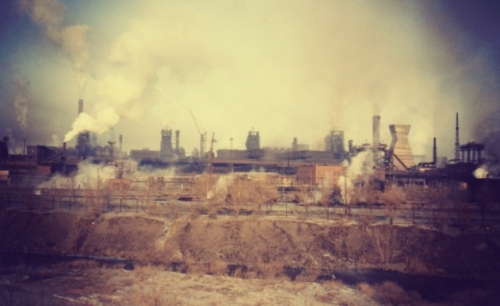 The OKMC steel mill was located near the city of Novotroitsk in the southern Urals. We built a slaughter floor and meat processing facility here – paid with proceeds from foreign steel sales. The steel mill General Director wanted to provide good quality meat products to his employees. I have fond memories of the people I socialised and worked with here. The Altai is a remote province in southern Siberia – near the Mongolian and Kazakhstan borders. Altai men are renowned horse riders, like their Mongolian and Kazakh neighbours. Locals lived in the great outdoors with easy access to animal protein in the form of venison, sheep and goat. Deer in this region produces some of the most biologically active deer velvet (the soft horn cut from the head of the deer before it becomes antler each year). The velvet is used for herbal treatments (such as aphrodisiac) in some Asian cultures. Horses were an effective means of herding the deer. There was a phase in Russian history where some grown men derived twisted pleasure from waving a traffic police wand at motorists. In the months following 1 May 1991 I seized every opportunity to purchase the wands from traffic police. (I was often apprehended for speeding in Moscow). They were grateful for the foreign currency and I was grateful to have the illuminated wands as gifts for friends back home.